· our separate EULA available on our applications for use on mobile and tablet devices. The Site is operated by DC Thomson & Co Ltd trading as ˜Scottish Wedding Directory’ (we, us and our). We are a limited company registered in Scotland. Our registered company number is SC005830 and our registered office is at DC Thomson, Albert Square, Dundee. Our VAT registration number is GB927167212. Aside from our advertisers and official partners who may display their advertisements on our Site, you may only use the Site for non-commercial use and only in accordance with these terms and conditions. You may retrieve and display content from the Site on a computer screen, print and copy individual pages and, subject to the next section, store such pages in electronic form. Additional terms may also apply to certain features, parts or content of the Site and, where they apply, will be displayed before you access the relevant features, parts or content. We reserve the right to withdraw any linking permission granted without notice. If you wish to make any use of material on our site other than that set out above, please address your request to info@scottishweddingdirectory.co.uk. You must only use the Site and anything available from the Site for lawful purposes (complying with all applicable laws and regulations), in a responsible manner, and not in a way that might damage our name or reputation or that of any of our group companies and affiliates. All rights granted to you under these terms and conditions will terminate immediately in the event that you are in breach of any of them and you must at, at our option, return or destroy any copies of the materials you have made in breach of these terms. You must not modify the paper or digital copies of any material you have printed off or downloaded in any way, and you must not use any illustrations, photographs, video or audio sequences or any graphics separately from any accompanying text. In the event you print off, copy or store pages from the Site (only as permitted by these terms and conditions), you must ensure that any copyright, trade mark or other intellectual property right notices contained in the original content are reproduced. We cannot and do not guarantee that any content of the Site will be free from viruses and/or other code that may have contaminating or destructive elements and cannot accept any liability for the same. It is your responsibility to implement appropriate IT security safeguards (including anti-virus and other security checks) to satisfy your particular requirements as to the safety and reliability of content. The Site may, from time to time, make chat rooms, message boards, news groups and/or other public forums or methods of uploading user generated content including our Noticeboards (collectively “Forums”) available to its users. By submitting your content or Postings, you give us and our group companies and our affiliated companies and third party service providers permission to use, copy, adapt, edit, translate, make available and transmit or otherwise communicate, display and publish such content (or any part of it) and to create any derivative works from it together with the ability to sub-licence the same whether we refer to your user name or not and to the extent permitted by law, you waive any moral rights you may have in your content (i.e. the right to be identified as author of or to object to derogatory treatment of such content). The grant of these rights to us is irrevocable, worldwide and royalty-free. This means that we can continue to publish, use and display that content even if you ask us to remove it or after your registration has ended. We can use all or part of your content in advertising and marketing materials for our products and we may edit the content as we wish. It is in our sole discretion whether or not we use your content. We can remove your content even if you have complied with our Community Guidelines and Acceptable Use Policy. If you do not agree to this, please do not submit any content to us. We may or may not use any user generated content provided to us. Whenever you make use of a Forum, send us content or make contact with other users of the Site, you must comply with our Community Guidelines and Acceptable Use Policy. You warrant that your contribution does comply with those standards, and you indemnify us for any breach of that warranty. Whilst we do not pre-screen Postings, we reserve the right, in our sole discretion, to delete any Posting submitted by you and/or to close any topic, at any time without notice to you. Complaints about the content of any Posting must be sent to info@scottishweddingdirectory.co.uk and must contain details of the specific Posting giving rise to the complaint. Further details of our take down procedure are set out in our Community Guidelines and Acceptable Use Policy. The Site may, from time to time, include links to external sites and banner advertising. We have included links to these sites to provide you with access to information and services that you may find useful or interesting but we do not accept responsibility for their content nor for their compliance with any laws and regulations. We have no control over the content of these sites or for anything provided by them and do not guarantee that they will be continuously available. We accept no responsibility for these sites or any loss or damage that may arise from your use of them. The fact that we include links to such external sites does not imply any endorsement of or association with their operators. Please refer to our Accessibility Policy for details of our current accessibility levels. 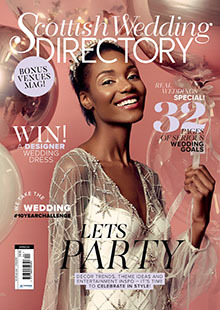 Please submit any questions you have about these terms and conditions or any problems concerning the Site by email to info@scottishweddingdirectory.co.uk, by telephone on 01382 575898 between the hours of 9am to 5pm, Monday to Friday or write to us at: Scottish Wedding Directory, DC Thomson, 2 Albert Square, Dundee, DD1 9QJ.